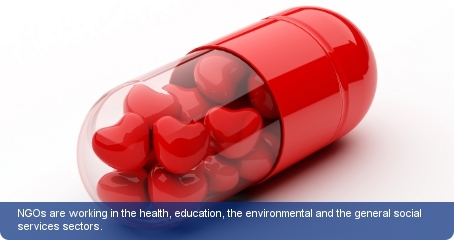 NGOs are working in the health, education, environmental and general social services sectors. International NGOs operating in the country include World Vision, the largest international NGO in the country, Oxfam and VSO. In addition, The United States Agency for International Development (USAID) is a prominent NGO operating in Swaziland and fighting against HIV/AIDS which primarily focus on prevention, human capacity development, non-governmental organisation capacity development and health systems strengthening. NGOs can become members of the umbrella organisation for NGOs in Swaziland, a quango, the Coordinating Assembly for NGOs (CANGO). NGO activities are co-ordinated through the Ministry of Home Affairs. Registration of NGOs is the responsibility of the Ministry of Justice. For full registration, NGOs must register under section 21 as a non-profit company. NGOs have to also protect their names and this is facilitated by the Ministry of Justice. The main trade unions which function in the country are the Swaziland Federation of Trade Unions (SFTU), also associated with the International Trade Union Confederation, and the Swaziland Federation of Labour (SFL). Some of the Swaziland’s trade unions are not a part of the national federation.